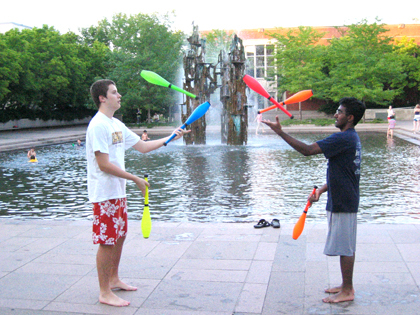 JUGGLING CLUBS: Students of the class of 2011 and members of the Princeton University Juggling Club Jakub Rajniak (left) and Bilesh Ladva practice their technique next to the Woodrow Wilson fountain outside Robertson Hall. Borough Council passed the municipal budget last Tuesday amid heated discussion. The 2008 budget is $25,264,214, which is an increase of over a million dollars from spending in 2007. The budget features a 5-cent tax increase, meaning that residents will now pay $1.03 on every $100 of assessed property value, as opposed to last years rate of $0.98. At the most recent meeting of the Princeton Public Library (PPL) Board of Trustees, Library Friends President Pam Wakefield reported that the Library Store, which offers items for readers and writers, including pens, desk accessories, note cards, card games, and jewelry, is losing money, and cannot continue in its present form. The store is currently run by the Friends and is staffed by volunteers. At its Wednesday evening meeting, the Princeton Regional Board of Education approved the appointment of Tri-State Consortium, Inc. to provide staff workshops on using student performance data to develop a rigorous framework for systemic planning, assessment, accreditation, and continuous improvement. The New Canaan, Connecticut-based firm will receive up to $12,000 for the workshops. Were redefining what a library can be said Amanda Braun, a 2008 Princeton High School (PHS) graduate and employee of the Princeton Public Library, adding, Theres nothing else like it. She was referring to the innovative programs geared toward young people that have included a wizard rock concert, a student film and video festival, and now the Recycle, Retro-fit, Reuse trashion workshop. My grandmother was the family historian, so I grew up listening to family history. Im so sorry that shes not around to know what Ive found out, observed Princeton Public Librarys Special Collections Librarian Terri Nelson recently. What shes found out is pretty awesome: her familys roots can be traced back to the Starbucks (the family, not the coffee shop) on Nantucket Island. Princeton resident Robert Stack, the president and CEO of Community Options, a non-profit organization that provides housing, support services, advocacy assistance, and locates employment for people with disabilities, has recently been named to New Mexico Governor Bill Richardsons Poverty Reduction Task Force. Matt Godlewski was looking forward to a quiet summer. She was the senior superstar of the 2006 Princeton University womens open crew but Caroline Lind wasnt a cool customer as the boat hit the water at Lake Mercer for the NCAA championship race. When Steve Coppola entered high school, he saw basketball as his main sport.